“Generating energy and a little saving for the nature in your daily life." The Bandy can give an opportunity to change riders’ behaviour of bicycles to generate energy for a tail lamp of the bicycle. Triboelectric is a cutting-edge science technology to convert flick energy into electric energy. Using this technology. As a Strategic Designeer, I try to adopt new technology in our life. In this process, I consider a relationship between people and society, and people and nature through the Bandy. 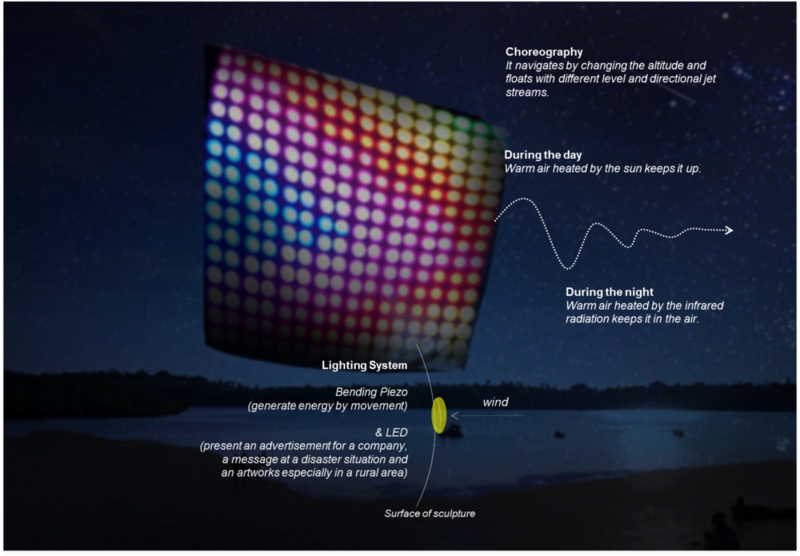 Firefly is a new sustainable media platform to deliver a message and lighting without any energy consumption borrowed by a concept of Aerocene project. Aerocene is a manifests as a series of air fuelled sculptures that will achieve the longest, emission-free journey around the world: becoming buoyant only by the heat of the Sun and infrared radiation from the surface of Earth. This hack looked at using a piezoelectric transducer to convert the movement of the Aerocene Explorer tether into electricity. After finishing the Aerocene Hack, I proposed a power generation system by vibration by wind and it can make energy to turn on LED as an advertisement, message and art. This could be used to power LED’s on the Explorer's surface, visualising the power of the wind, or other low energy components of the hardware payload.